Fill in your details below and we will let you know within 24 hours if we can get Conflict Of Heroes: Awakening the Bear to you with haste! The year is 1941. Germany has attacked the Soviet Union, easily overwhelming their defenses. German forces are now deep in enemy territory - but winter is coming and the Soviet bear is awakening! 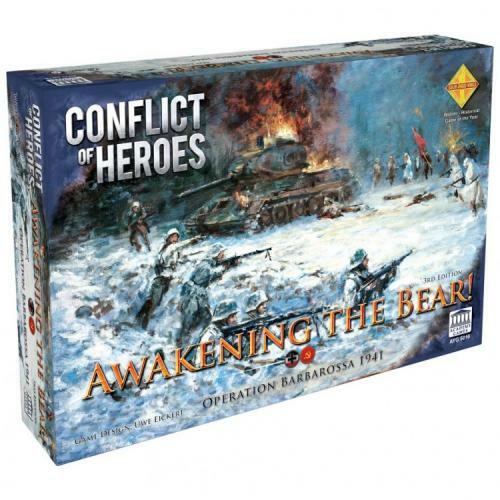 Awakening the Bear is a fast-paced World War II wargame with real-world tactics, highly detailed maps, fluid gameplay, and easy to-learn rules. Take command of infantry, tanks, mortars, planes, and more in the largest military campaign of WWII.